He cuts a lonely figure in the late afternoon sun at Newcastle United’s Benton training base. He has done for six weeks now – with the exception of a week spent in Portugal, where he was still sticking diligently to the fitness programme in an effort to put to bed a nightmare couple of years. Two weeks before the first of his colleagues start filing back to Tyneside for a mixture of medical tests and quick fitness checks, Ryan Taylor is – apparently – relentless. Even allowing for a short break in the Algarve last month, his work programme has been absolutely non-stop. In the last weeks, he’s progressed from the anti-gravity treadmill and the endless shuttle runs. Now, he looks like a footballer again, and one – it must be added – that Newcastle United will benefit greatly from having on board. For all the talk of United’s desperate need for a striker this summer, there is another gaping hole that Newcastle need to fill during their recruitment drive: a dead-ball specialist. Since Yohan Cabaye left, United’s consistency and accuracy from dead-ball situations has been woeful. Much was made of their lack of goals from corners, but by the end of last season, they were struggling to even apply the lightest of pressure to opposition defences from those positions. By the end of the season, it told. United ranked 15th out of 20 in the Premier League at scoring from dead-ball situations last season, netting just eight while Liverpool – runaway leaders on that front – managed to find a way through 26 times. Cardiff, Fulham, Sunderland and Southampton all scored more despite their struggles. It tells just half the story. 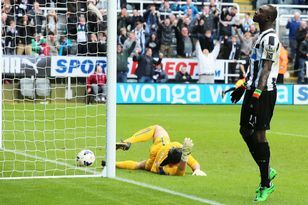 A low point of Newcastle’s campaign was when set-piece responsibilities were passed around the squad as if they were an unwanted burden, and watching Paul Dummett’s confidence ebb away as he attempted to recreate the impact of Cabaye was numbing. At one point, Cheick Tiote was even given the responsibility. If the Magpies are to regain some of the attacking momentum that dissolved as the season fizzled into nothingness, they need to make sure that they include a dead-ball specialist among their summer hit-list. As welcome as his return is, Taylor and his right foot cannot be expected to do it alone. To be fair, Alan Pardew did draw attention to it in those transfer summits before the club’s hierarchy broke up at the end of the season. Clement Grenier, deadly from a set piece, was included on the short-list as part of the solution. Ajax playmaker Siem de Jong, another watched by Newcastle, can also take them. Neither are any closer to moving to Newcastle than they were in May, but the summer is still young. The problem may yet be addressed. It is a lesson that Roy Hodgson might want to soak in too. The World Cup has thrown up many stirring talking points, but the diminishing power of the free-kick is one that has slipped under the radar. It is a theme that is yet to be picked up as the England inquest gathers pace. The Three Lions’ mentality is one recurring theme, with United boss Alan Pardew among the critics who claim that the team aren’t “nasty” enough to progress. It is a point that was echoed by Wayne Rooney during the tournament, with the striker bemoaning England’s lack of cuteness in the heat of the World Cup battle. Another criticism is ability and the dwindling pool of players that Roy Hodgson had to pick from. The structure of the Premier League, some reckon, works against England by auctioning starting places at the country’s best clubs out to the biggest bidders. It is amazing that not one person has taken a forensic look at the two performances in Brazil and pin-pointed a more prosaic reason for England’s early exit: they just weren’t effective enough at set-pieces. Throughout the last few tournament cycles, dead balls are where England have really prospered. Against France in the Euro 2012 opener, Joleon Lescott nodded Steven Gerrard’s free-kick past Hugo Lloris to put the Three Lions in front (a position they have not been in out in Brazil). During the David Beckham era, a well-delivered free-kick or corner was England’s main weapon, but during this tournament, the Three Lions have barely been able to beat the first man with their dead balls. They have gone close once or twice – Rooney in the first half against Uruguay springs to mind – but the consistency of delivery has just not been there. That has surprised opponents who have come to expect England to be dangerous from corners and penalties. The pressure that is usually applied by England during games has been absent, and it has reduced their threat significantly. One team who haven’t suffered quite so much is France. Wistfully, we have watched Cabaye crafting. It is a memory that United must exorcise next season.